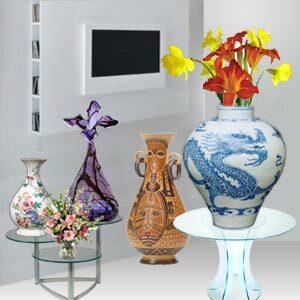 A vase can be construed not only an attractive but also a creative piece of a room's decor. While most of the times vases are used to display a floral arrangement, there are times when the vase is left alone by itself as an intrinsic piece of creative art. Multiple vases with contrasting and complimentary hues and tones can become part of a creative arrangement. They can adorn several places at home including a large mantel or a small coffee table. While tiny glass vases look stunning on a sunny window, marble vases would be more appropriate for a room with natural stone features. Stainless steel pieces should be more suitable for a modern setting. A treasure vase can be chance find in an attic or a basement. It could be a beautiful crystal one or the heirloom china urn which is worth a fortune these days. Lady head vases, depression era glassware vases and oriental vases are extremely popular and looked upon as antiques by collectors. Value of an antique piece also depends on its intricate design and uniqueness. While a Lady head vase is relatively inexpensive because it is sturdy; depression era glass vase is more valuable because it is fragile and it is difficult to find an antique piece that is intact. Oriental vases are handmade and very rare and so relatively more costly. The age of the vase is also significant as is its manufacturer. While a mass produced glass vase is worth much less, a handmade vase or a vase produced in limited quantity by a manufacturer who is no longer in business is worth much more. Similarly there are several features that go to make an antique vase potentially worthy or not. It should reveal a clear mark that indicates the maker or manufacturer. Truly valuable vases possess defining characteristics that make them easily identifiable with a distinct date. It is always recommended to buy an antique vase that has a clearly written return policy in case of doubt. Also, better not to go by the electronic photographs but examine the original and then decide on the purchase. The class of the crystal vase is defined on the number of cuts made on the glass. Crystal vases are available in plenty of varieties from self colored to carved niches. Crystal vases come in branded and non branded variety and both are immensely popular. In fact most crystal vases are made to order. However, it should be remembered that crystal vases are available up to only a particular size and gigantic size crystal vases are not very easy to locate. Vases made of polymer clay have many decorative uses. Since the clay is made of plastics it is flexible and durable at once. The clay also comes in a multitude of colors to enable create a swirl pottery vase with style and special effects. These vases come in metallic and glow in the dark colors as well. For instance a jade green turquoise pottery with rich variations in color can decorate a small bedroom with its splash of color. A large perfume bottle shape pottery vase works well in bedrooms. For those who are looking for an inexpensive and yet stylish way to decorate a house, the glass vase is the perfect buy. Much of the appearance and luster in a glass vase depends on the quality of its craftsmanship. Sophisticated glass vases come in various shapes, sizes, forms, colors and unique designs. Many always think of glass vases with plants of some kind inside them. This need not be always true. Other decorative items such as a confetti, colored paper or even colored water can enhance the appearance of a glass vase. A simple clear glass vase with colored water in it can make it interesting and different to look at. Hand blown glass vases are tall enough even when flowers are not included. Blown glass vases are used as centerpieces for celebrations like wedding receptions. These vases are also great for anniversary parties, graduation parties and the like. Glass blowing as an art form dates back to 100 BC when the Romans are believed to have molded molten substances using a blower. Hand blown bud vases are made of recycled art glass. The unique characteristics of blowing recycled art glass include tiny bubbles and random color streaks throughout the glass. For instance, a very unique hand blown vase comes in light green shade with dark green and blue spots. The snipped crown lip has light green tips. The vessel stands atop a swirled blue twisted foot as if emerging from the ocean's surface. Porcelain is a type of ceramic and it is distinct from earthenware and stoneware. Porcelain vases are often lavishly embellished with open work designs. For instance, exquisitely crafted Marilyn Monroe collectible porcelain vases, are sleek and shapely and could cost a fortune. Porcelain vases which can be absolutely stunning complement any home décor. Porcelain vases come in several great styles as well. In some the handle can be seen on the side of the neck of the vase. There is also the wider vase with narrow neck called wine vase. A bell vase is the very wide vase variety. This is an art form developed some 11,000 years ago using ceramic ware to make hand built pottery vessels. Chinese tradition shows evidence of two primary categories of ceramic ware, one high fired and the other low fired. The elegant Chinese porcelain vase is seen decorated most of the time with traditional Chinese dragon symbol on both sides. In China, dragon is considered as a most auspicious symbol of power, good luck and good fortune, prosperity and attainment of success, wisdom and courage, self esteem, happy marriage and lasting love. It can be seen that Chinese porcelain is usually thinner than Japanese and does not have the stilt marks. But Chinese have a reputation for high quality porcelain. Chinese Oriental porcelain vase displays many meaningful drawings and symbols. While the picture of Crane suggests long life, peacock is for blooming and bounty, butterfly for happiness, warrior for safety and protection, and elephant for good fortune. The Satsuma region of Japan is known to have produced many styles and types of pottery for over 200 years. Satsuma vases are very popular with collectors. These vases come as tall as 9 to 10 inches and are intricately decorated with images of Japanese Geisha girls or images of wild life. Japanese Satsuma vases which are elegant and beautiful are mainly used to display flowers. Some Japanese vases come with gorgeous lids resembling a hat. Yet another type of vase famous in Japan is the compressed bamboo vases. Japanese believe that giving bamboo as a gift is to give good fortune. These vases are typically big measuring 9 inches high and 10 inches in diameter at the base, amply sized to hold flowers. Each vase takes a minimum of 45 days to complete, after the bamboo has been soaked for about 6 to 12 months time. The soaked bamboo is cut into very fine strips and pressed into a curve. The strips are then coiled outward. This large bamboo vase is decorated with design of various sword guards. Typically this is done in lacquer, gold and mother-of-pearl. While looking at Chinese and Japanese vases, it is not only the motifs but the border and rim decorations and the plain enamel finish inside or underside the item that is distinctly different. For instance, many Chinese vases are finished with bright and smooth turquoise blue interior; Japanese vases reveal an orange peel enamel texture and display mottled dark green, yellow, grey or navy or blue enamel. Chinese vases are usually bigger and heavier while Japanese potters like much smaller shapes with odd angles and proportions such as a fat squat body and long slim neck. It could otherwise be a melon shape based Japanese vase with a tiny top rim. First Published Date: 4 Dec 2009 Last modified Date: April 18 2019 This page may have been updated recently as new information is available or the content may have been edited for better readability.